Servers & Switches - MFDC GROUP INC. 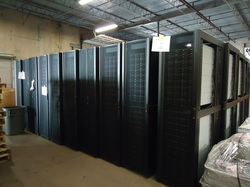 CONTACT US FOR IF YOU HAVE CISCO, DELL, IBM OR HP SERVERS/SWITCHES OR PARTS FOR SALE OR IF YOU WANT TO BUY. WE BUY & SELL. LET US KNOW WHAT YOU WANT. INCREDIBLE DEAL WHILE QTY AVAILABLE. WE ARE READY TO MOVE THESE. $75,500 FOR 22 SERVERS IN RACK FULLY CONFIGURED AND CABLED. Ultra-dense 2U shared infrastructure, the Dell™ PowerEdge™ C6100 supports up to 4 independent server nodes, providing capacity, performance and flexibility in a very dense eco-friendly package. IBM, HP, DELL, CISCO, ETC. LET US KNOW ANY REQUIREMENTS THAT YOU MAY HAVE. 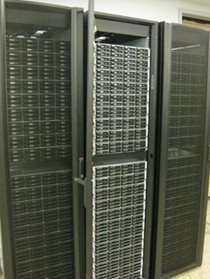 We have 45 racks x 22pcs of the Dell PowerEdge C6100-XS23’s that have been decommissioned by a Tier I Technology company’s major Data Center. Bonus Special 1 server free per rack. Your Price $75,500USD. includes 1 rack x 22 servers ( plus 1 bonus for total of 23 servers) fully configured and cabled. Designed with your needs in mind The Dell PowerEdge C6100-XS23 is a hyperscaleinspired building block for high performance cluster computing, Web 2.0 and cloud builders. The PowerEdge C6100-XS23 high-efficiency fans and power supplies are shared across nodes, saving space and weight to create one of the most eco-friendly designs yet. Best-in-class density without sacrifice Increasing density shouldn't mean sacrificing critical features such as singlenode serviceability and hot-plug hard drive flexibility. With four 2-socket server nodes in a 2U rack chassis, the PowerEdge C6100 offers maximum density with the convenience of both single-node serviceability and hot-plug 3.5" hard disk drives (HDDs).